We flourish in the intersection of chemistry and physics, carrying out fundamental research in cooperation with the other divisions to enhance the scientific value of materials development. Higher order structures and their formation process of polymer systems are investigated by means of scattering methods (neutron, x-ray and light scattering) and microscopes (optical, electron and atomic force microscope), to reveal the relationship between polymer properties and higher order structures. Ordered Tricontinuous Double Diamond structures of triblock copolymer by two-step phase separation. 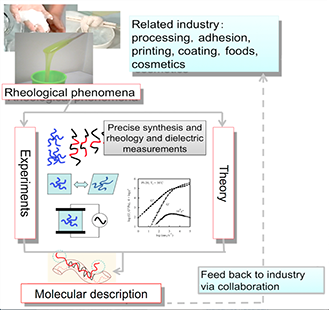 Rheology and dynamics of softmatters are investigated from molecular viewpoints in various space and time scales with multiple experimental methods and theoretical approach: Homogeneous polymers behave as glass, rubber and viscous fluid depending on temperature and/or time, and heterogeneous polymeric materials may also exhibit plastic behavior. 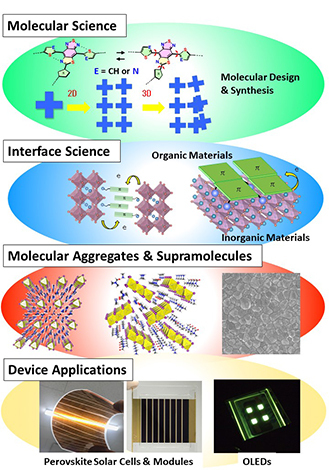 We focus on the correlation between molecular structures and the physical properties of organic semiconductor compounds, applying skillful molecular design to leverage the unique properties of structural geometry and functional group elements. Spectroscopic evaluation singles out high-added-value materials for organic electronic devices such as perovskite solar cells or organic electroluminescent diodes. We also explore the fundamental physical functions and material properties driving the realization of high performance devices.